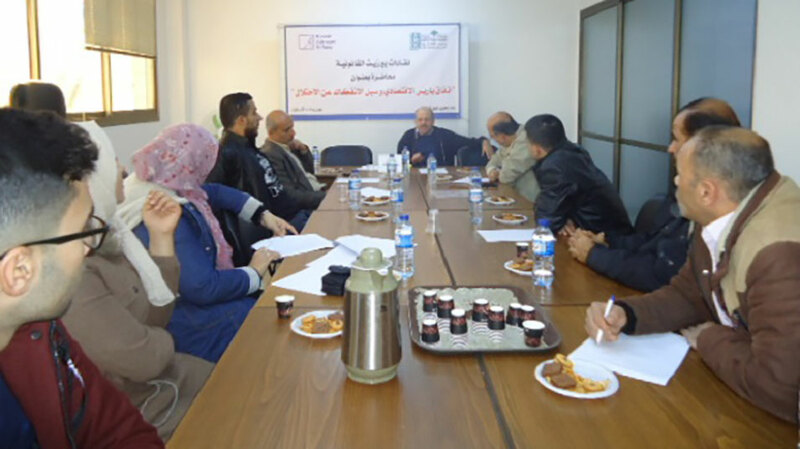 The Institute of Law at Birzeit University hosted Samir Abu-Mdalaleh, an associate professor of economics at Al Azhar University - Gaza, in a lecture on the Paris Protocol that governs the economic relations between Palestine and the Israeli Occupation, on Tuesday, December 11, 2018. In the lecture, organized together with the Konrad-Adenauer-Stiftung and chaired by Lina Al-Tonisi, coordinator of the Institute of Law in Gaza, Abu-Mdalaleh gave a brief overview of the Paris Protocol, noting that it was signed between the Palestine Liberation Organization and the Israeli Occupation in 1994 as the basis by which the economic relations between the two are determined. While some thought that the protocol would benefit the Palestinian economy, the economy’s rate of growth has remained stagnant for the 24 years since its passing, Abu-Mdalaleh said, noting that the Palestinian economy was turned into a service economy with a dominant consumerist trend. Abu-Mdalaleh noted that Palestinians are obliged by the Paris Protocol to levy a value-added tax no higher than 2 percent of the amount taxed by the Israeli Occupation - 17 percent - which resulted in the Palestinians’ inability to offer basic goods at lower prices and denied them the opportunity to bolster their nascent industries with the revenues of these taxes. As per the Paris Protocol, the Israeli Occupation completely controls crossings, borders, and movement of goods and people in and out of Palestine, commented Abu-Mdalaleh, saying that as a result, Palestine can only export to or import from countries that have existing relations with the Israeli Occupation, while abiding by its standards and specifications. Abu-Mdalaleh also remarked that, as an occupying force, the Israeli Occupation cannot subsume the Palestinian economy and the Israeli economy under one customs union under international law. Should the Palestinians mitigate the impact of this customs union, he clarified, they would be able to lower the value-added tax levied against their products, and as a result improve the Palestinian production base. At the end of the lecture, a number of recommendations were suggested to improve the economic situation in Palestine, such as amending the Paris Protocol so that borders are opened and economic restrictions are lifted; implementing the Paris Protocol such that economic relations are established on equal grounds; and giving administrative control of Area C districts in the West Bank to the Palestinian Authority.